About Us: History and background of AthleteInMe.com®. AthleteInMe.com® is a RESOURCE and an online SERVICE. AthleteInMe.com® is a comprehensive source of information on exercise and fitness, fitness gear, and sports nutrition. Quite honestly, we believe it is the best exercise resource on the net. And so do others: In 2011, we were recognized by Web Health Awards! • Exercise-Health: Examples here include the beneficial effects of exercise on diseases such as arthritis, asthma, dementia, depression, diabetes, heart disease, hypertension, metabolic syndrome, obesity, osteoporosis, and many others. • Exercise-Fitness: Examples here include topics such as exercise heart rate, summaries of a wide variety of sports activities, and other topics that help you take your fitness to the next level. • Exercise-Training: These topics appeal to more serious athletes. We offer detailed information on sports nutrition, comparative information on energy bars and energy gels, and scientifically-based information on sports supplements. You will not find another web site that covers exercise from the variety of perspectives that we do! AthleteInMe.com® is intended for consumers of all fitness levels: from sedentary to weekend-warrior to elite athlete. However, because our information is quite detailed, coaches, athletic trainers, and even healthcare professionals will find AthleteInMe.com® useful. Essentially anyone wanting high-quality information on various aspects of exercise, fitness, training, and sports nutrition will find AthleteInMe.com® a valuable resource. What makes AthleteInMe.com® different from other consumer-health sites? First, AthleteInMe.com® focuses exclusively on Exercise. We do not discuss general consumer-health issues such as ear infections in children, dental care, what foods to eat to lower your risk of cancer, etc. No other web site provides as much detail on the beneficial effects of exercise on disease and health, while also addressing fitness and training issues, as AthleteInMe.com® does. Second, because we focus exclusively on exercise, we go into greater depth. Many consumer-health sites publish stories that, while interesting, offer little in the way of useful, specific information that you can directly apply to your life. Our intent is to provide you with the tools that will help you improve your health, your fitness, and perhaps might make you a better athlete! Finally, all of our information originates from high-quality sources. We don't offer opinions or recommendations without supporting those statements with facts. We review sports medicine journals, clinical medicine journals, consumer health and fitness magazines, and books on fitness, training, and sports nutrition and distill that research into practical, useable information. We read the books and journals so you don't have to! Is AthleteInMe.com® a diet and weight-loss site? No. However, it is impossible to review some exercise and health topics without also getting into diet and nutrition issues. Dieting and weight-loss issues are addressed only where appropriate. Generally, when nutrition is discussed, it is from a sports nutrition perspective. The creator of AthleteInMe.com® and Editor-in-Chief is Stan Reents, PharmD. Dr. Reents is the author of the text "Sport and Exercise Pharmacology" (Human Kinetics, 2000) and the former Editor-in-Chief of Clinical Pharmacology (Gold Standard, Inc.). He has published dozens of research papers in journals such as Annals of Internal Medicine, Annals of Pharmacotherapy, Chest, New England Journal of Medicine, and others. Dr. Reents is a member of the American College of Sports Medicine (ACSM) and has been an invited speaker at NATA. He was first certified as a personal trainer by the American Council on Exercise (ACE) in 1994. In 2005, he obtained the Health Coach certification from ACE. In 2011, he obtained the American College of Sports Medicine's "Health Fitness Specialist" certification. 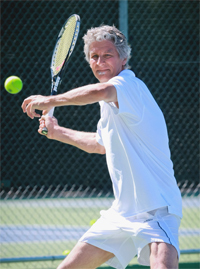 He is also a USTA-certified tennis coach. Does AthleteInMe.com® have any business relationships that would be considered a conflict-of-interest? No. AthleteInMe.com® is produced by AthleteInMe, LLC, a privately-held company based in Phoenix, AZ. Our mission is to deliver accurate, unbiased information. We take this issue seriously so as to avoid any perceived conflict-of-interest. In 1995, I read a paper called “Healthy People 2000: A Mid-Decade Report”. It was a summary of progress (lack thereof) made towards the health goals that were developed in 1990. With the decade half over, not much improvement had been seen. Reading that report made me realize that the medical community was failing. Even though we spend more dollars on health care every year than other developed nations, we have higher rates of obesity and heart disease, and the longevity of Americans is not as good as in other countries. It was at that point that I made a decision: I decided to switch from participating in the treatmentof disease and, instead, focus on the preventionof disease and the promotion of health. I began what has now become a 20-yr effort to promote exercise as a strategy for maintaining optimum health. Exercise really is "the magic bullet"
Medicine sometimes uses the label “magic bullet” when referring to a new drug. However, there is no such thing. Although some new drugs are truly impressive, cancer drugs and clot-busting drugs have horrible side effects, resistance eventually develops to almost all antibiotics, and even the newest miracle drugs - “statins,” “COX-2 inhibitors,” etc. - have problems. Cardiovascular disease is the #1 cause of death while arthritis is the #1 cause of disability in the US. Exercise is good for both. Cardiovascular disease -- not breast cancer -- is also the #1 cause of death in women. (Cardiovascular diseases kill 10 times more women than breast cancer does every year). In fact, in recent years, more women died of heart disease than men did. In general, women get less exercise and physical activity than men do. We are concerned about loss of functioning in old age. 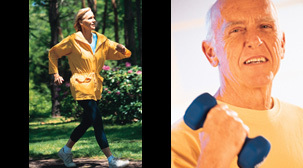 Exercise can reduce the rates of dementia and osteoporosis and can significantly improve quality of life in the elderly. Obesity and diabetes are rampant in our society. Recently these diseases have been appearing in children (how sad is that?). Exercise is the key to preventing the development of these life-long diseases. In fact, research shows that exercise is beneficial for a seemingly endless list of medical conditions: back pain, type-2 diabetes, elevated cholesterol, coronary artery disease, hypertension, metabolic syndrome, various forms of cancer, osteoporosis, stroke, dementia, depression, heart failure, claudication, fibromyalgia, Parkinson's disease, and…well, you get the idea. The thing is, by having fun exercising, you can ward off some of these terrible diseases that strike in middle and old age. With regular exercise, you might be able to avoid the need for blood pressure and cholesterol drugs, and you might never be confined to a wheelchair in old age because you are too frail to walk. Since the mid-1990's, the growth and adoption of the Internet has been explosive. The Internet is now as entrenched in American culture as cell phones. However, while the Internet makes it easy to obtain information, it doesn't guarantee that the information is reliable. Done properly, I believed a credible, web-based resource on exercise and fitness could be developed. In January 2005, AthleteInMe.com® was launched. But don't be misled by the name. Certainly, we want serious athletes to use our site. The name “AthleteInMe” was chosen not because our target market is elite athletes, but because I believe there truly is an “athlete” inside each and every one of us. Remember when you were a kid? Exercise is fun! Well, that kid is still inside you! In addition to serving as a health and wellness resource, I want AthleteInMe.com® to be your one-stop-shop for anything and everything pertaining to exercise. In other words, we aren't going to limit our content to just scientific research on exercise. As our site grows, we will be adding data on all kinds of fitness gear, reviews of exercise DVD's, and many other cool features. So, I hope you use our site regularly, as we update the content frequently. Sign-up for our monthly e-newsletter to stay on top of our newest changes. And, when you need assistance with your health or exercise program, please consider our Online Exercise and Fitness Coaching Service. It may just be the best investment in your health that you'll ever make! Feedback is important to us, so let us know what you think.